Geotechnical engineering and rail infrastructure expert Professor Buddhima Indraratna received the most prestigious award at the combined Australasian Railway Association (ARA) and Railway Technical Society of Australasia (RTSA) Gala |Dinner and Awards Night held at the NSW Parliament House. Prof |Indraratna received this most prestigious honour within the Australasian Railway Community from the State Minister for |Transport and Infrastructure, Hon. Andrew Constance (see Photo). The RTSA Individual Award is offered annually to a person who has made an outstanding contribution to the railway industry. RTSA is a joint Technical Society of Institution of Engineers Australia and Institution of Professional Engineers New Zealand, formed to further the interests of the railway industry at large and its individual participants. It was established as a non-profit organization in 1997 for the purpose of promoting the co-operation of academic, industrial, commercial and governmental organizations in relation to the practice and advancement of railway technology and management predominantly in Australia and New Zealand. 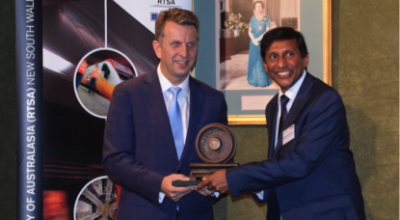 The 2015 RTSA Individual Award was received by Prof. Indraratna in recognition of his overall career achievement in providing an engineering and technical service to the wider railway community both nationally and internationally, innovation of his research outcomes, the degree of autonomy in which he currently operates and the quality and appropriateness of publications that have been presented in high quality journals and reputed international conferences. Through this prestigious award RTSA acknowledged the impact he has made to rail industry worldwide thereby influencing the technical standards and rail practices with respect to track design, as well as construction and maintenance through both fundamental and applied research. In particular, the award clearly acknowledged his efforts which have revolutionised track infrastructure in terms of design innovations and extended longevity, enabling faster trains carrying heavier loads. Professor Indraratna, who founded the Centre for Geomechanics and Railway Engineering at the University of Wollongong, is also a Program Leader of the ARC Centre of Excellence in Geotechnical Science and Engineering that focuses on Transport |Infrastructure as a major theme. Congratulations to Prof. Indraratna for being the 2015 RTSA Individual Award Winner.